Those mole people/morlocks have to WORK in the morning people! Maybe it's accessible only by elevator, ladder, or athletics. WV: plain -- Well, that's self-descriptive. That's some really nice handwriting, though. 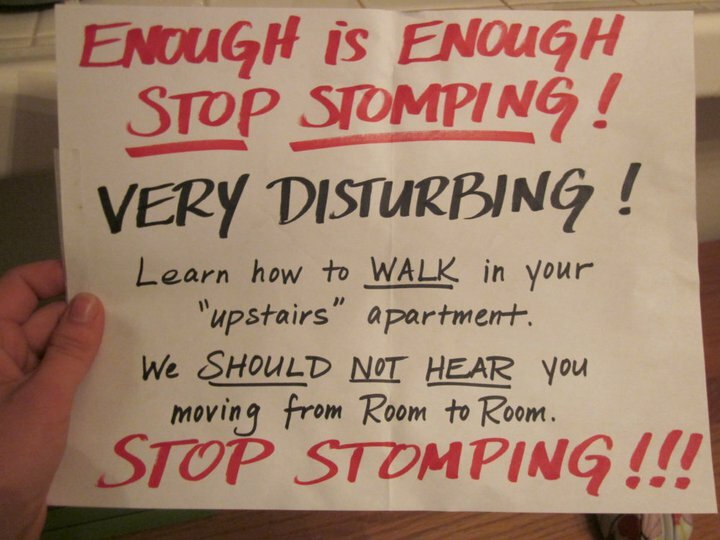 I think she should go down two floors, see how the people below the note-writer feel about the sound coming through their ceiling, and then offer this handy pre-written note if they're displeased. Pay it forward! I agree with Simon that it’s lovely penmanship. “Upstairs” just may be God in Heaven. Stop stomping, God! WV: cominest = That red ink denotes members of the cominest party. "upstairs"? It maybe was hand delivered when they fell through the floor? Guess that would stop them from stomping.